Submitted by witness on Monday, March 12, 2012. 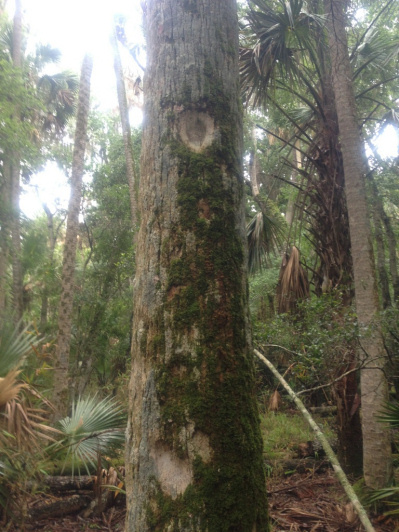 LOCATION DETAILS: The Bulow trail is located between Bulow State Park off of Old Kings Road and the Fairchild oak off of the Old Dixie Highway. OBSERVED: I was out hiking one morning on a popular local trail when I decided to explore the area around it using my GPS. It is an open hammock containing old growth liveoaks with a lot of surrounding history from the sugarmill period all the way back to the first native americans that inhabited the area thousands of years ago. I was "off trail" approximately several hundred yards when I came upon an un-natural looking intertwined tree formation capped off with a dead "y" shaped branch weaved in the top. I tried to think of how this could have occurred naturally but it simply could not have. I marked the site and took pictures and basically forgot about it until I read a report of an encounter in the same area by some local fishermen. I now wonder if it is a navigation or territory marker of some kind. 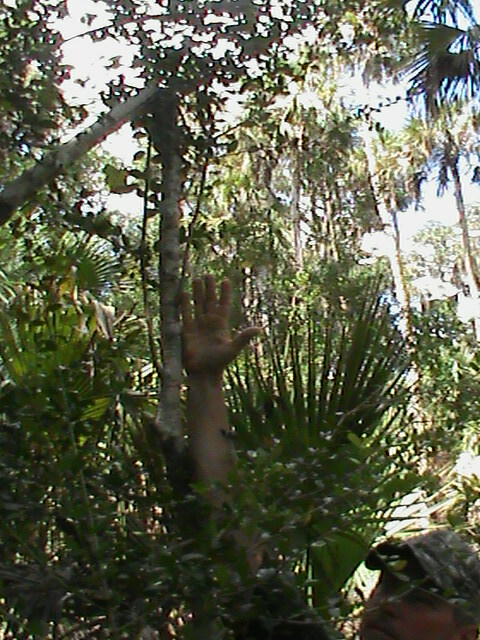 ALSO NOTICED: Approximately a year previous I was exploring the east boundary along Bulow Creek when suddenly I smelled what is commonly associated with the odor of a wet dog. It like hit me in the face. I stopped and checked the wind direction and listened. Nothing. I proceeded into the wind along the creek but found nothing. Later I realized that I really wasn't lookin up into the trees. 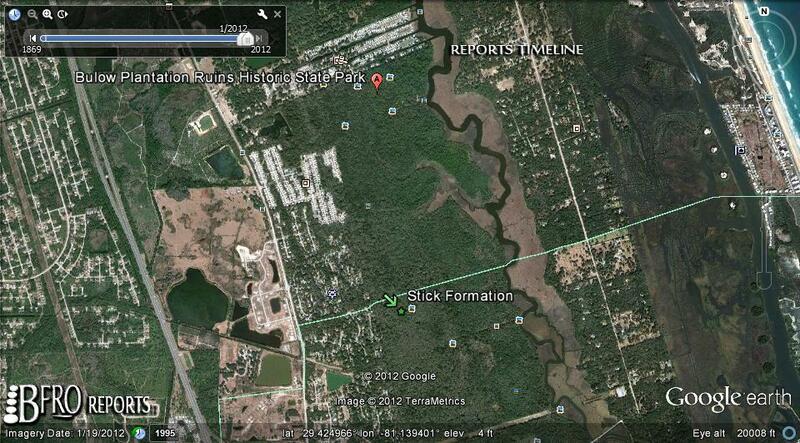 OTHER STORIES: I recently read a report in this area in "Recent Sightings" prompting me to report this information. TIME AND CONDITIONS: Mid-morning, cool and clear. ENVIRONMENT: The area is an old growth hammock with multiple fresh water sources surrounded by saltwater marsh on the eastern boundaries. There is a large wild hog population with deer and armadillo present also. 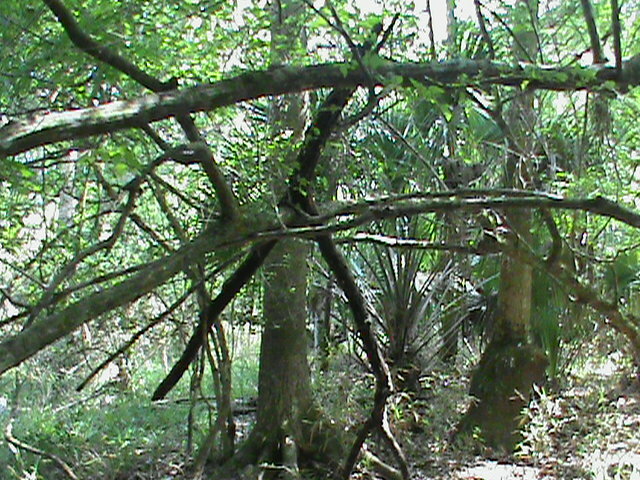 Stick structure formations are structured arrangements of tree branches, stones, and even skeletal remains that appear to be markers or symbols, and are believed to be constructed by Sasquatches to communicate to other Sasquatches. They are often found where there is bigfoot activity. Arrangements can be in the form of branches placed together in a tipi-like cone, a series of stones stacked in a column, saplings twisted; bent at right angles and pointing in a specific direction, or bones often arranged in geometric patterns. After reviewing four photos he sent, I met him several days later at the park. The witness has a very respectful regard to nature, spends a lot of time hiking, and is very aware of his surroundings. He is familiar with the trails and took me right to the possible stick formation. This formation is about 100 yards off the trail, and would have been easy to miss if the witness had not been looking for such evidence. When looking at the formation in person, it is evident that it did not occur naturally. 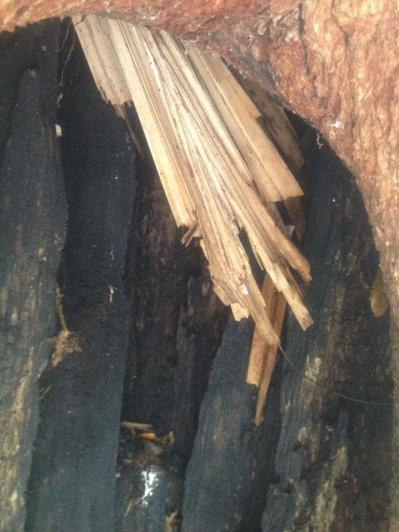 The large dead stick in the middle did not come from breaking off above or near the structure. It was deliberately placed there. Another sapling was bent under two branches; this could not have happened without a strong force. It took both the witness and I pulling on it together to disengage and reposition it. It is a very interesting formation, similar to others that have been documented. Heavy leaf litter prevents foot prints. 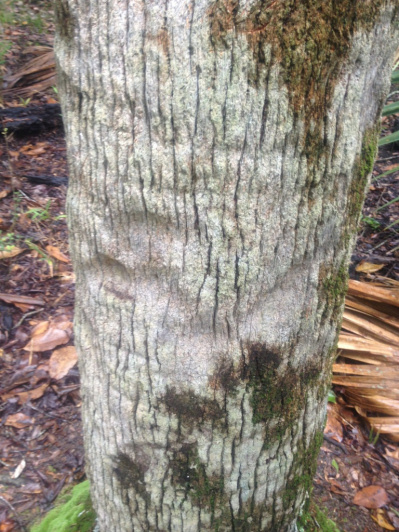 Bulow Creek State Park is 5,600 acres of first growth oak forest. It has one of the oldest oaks in Florida – a 700 year old tree. 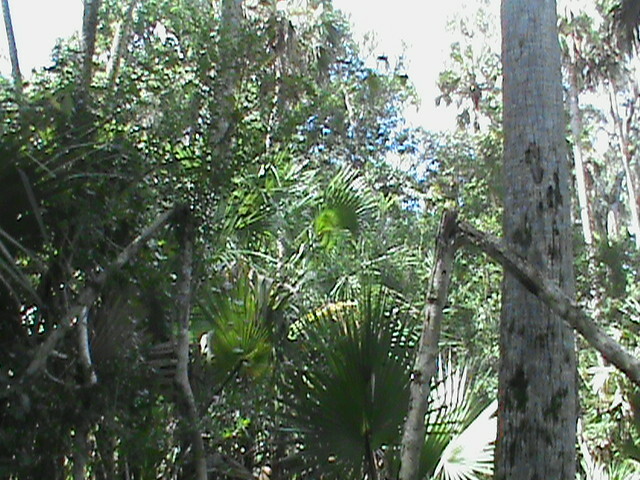 It is a unique spot in Florida, as there are not many Live Oak forests left in Florida. 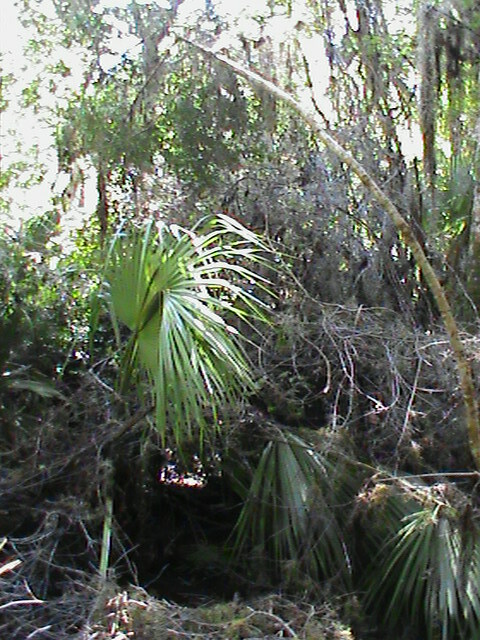 There are springs, creeks, and numerous types of wildlife. It is prime habitat for Sasquatch and could support them. 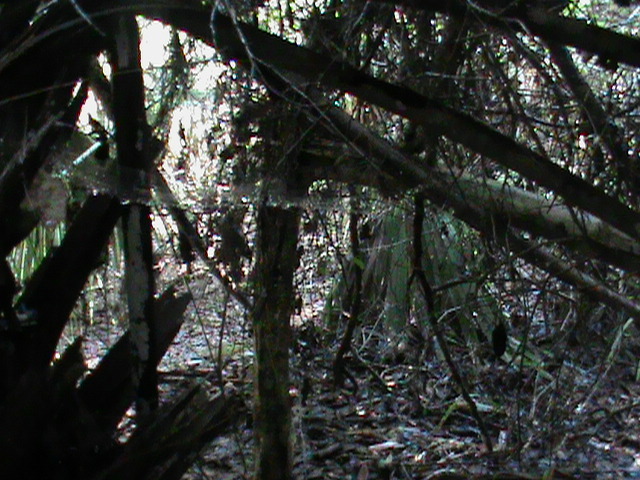 It has several trees bent over it with moss, palmettos, and broken branches that are formed into an "igloo" shape. Everything in the area is pulled or bent towards it. The branches are obviously put there as is the moss that is woven throughout. 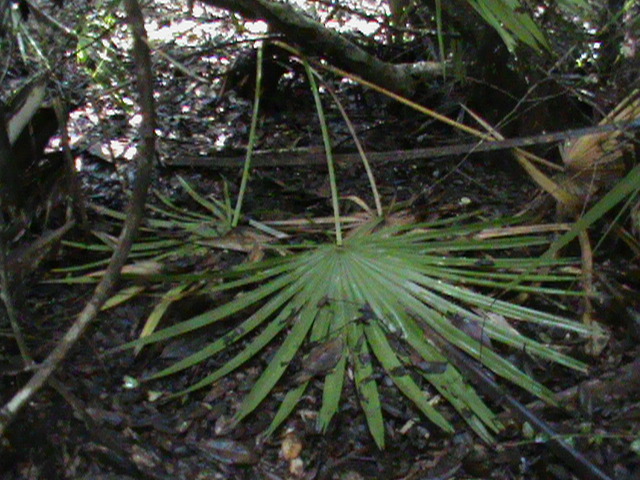 Palmetto fronds cover it, and a few are on the ground like a rug. One has to bend down to go inside the round opening, but once inside an 8 ft body could lie down. It is not a natural occurrence. Twisted, broken trees (at the 6 ft+ level from different angles) encircle the rounded base. No branches are cut. When the witness discovered the site he was totally “creeped out” and didn’t feel that he should stay in the area. He took a few photos and immediately left but did visit it again later. I crawled around inside trying to find hair or prints, but found none. As it would be, the night before I visited the site, a major thunderstorm blew through the area. No prints, hair or odors were detected and it didn't appear to be currently used, possibly an old shelter. Less than a month after its discovery the BFRO received an early morning road crossing sighting at the SW end of this park, about 8 miles away from this location. The marshy-woods are all interconnected in this area. 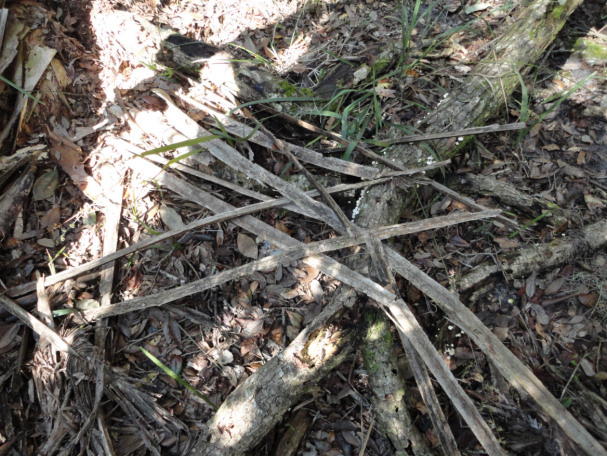 The branches were all broken, not cut, and woven into a "tic, tac, toe" pattern. It is highly unlikely anything could fall naturally into this pattern when the trees the fronds came from are low growing and several feet away. The off-trail, remote location makes it even more unlikely a person did this. The investigation continues and updates will be added.